Fun vintage hinged 'clamper' bangle bracelet. 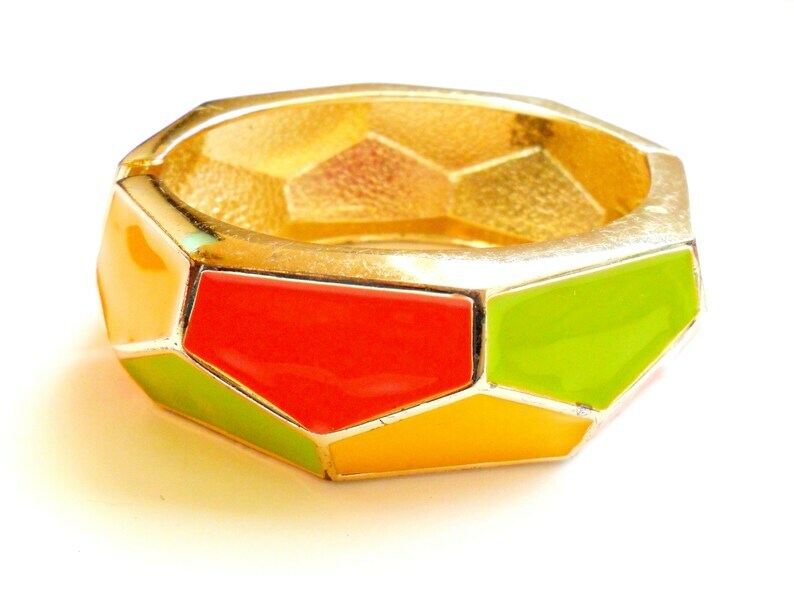 Faceted design with orange, green, and yellow enameled panels. Gold tone base color. Bracelet shows some slight plate loss, but is in good condition, overall. The spring hinge is nice and tight. Bracelet is unsigned. Outer width measures 3 inches. Inner width measures 2 3/8 inches. Width of band measures 1 inch. Smaller than I expected, but it's an adorable bag. A beautiful vintage card in perfect condition, adorable packaging, fast shipping. What more could you want? Thank you!